Thomas A. McGlynn was born March 29, 1878 in San Francisco, California. As a child growing up in the Bay Area, McGlynn was fortunate to be part of the Columbia Park Boys Club, a forerunner to the Boy Scouts. The group not only provided the young boys with valuable knowledge of manual crafts, it also granted McGlynn the opportunity to begin his artistic training. At the age of thirteen, the young McGlynn got trapped under a lumber pile and his back was crushed. For the rest of his life he used either crutches or canes, but this never slowed his dedication to his art. McGlynn’s formal art training began in 1899 with a full scholarship to the California School of Design. The director, Arthur Mathews was delighted with McGlynn’s craft background. A long and enduring friendship formed between the two men. During his years of enrollment at the California School of Design, McGlynn also met his bride to be Gertrude Gorter. The two often painted together near her parents home on the Russian River, and collaborated on a section of the University of California’s 1905 yearbook, The Blue and Gold. After the earthquake in 1906, McGlynn began doing free-lance design for several businesses around the San Francisco area, and he taught at the University of California. One of McGlynn’s projects included creating designs for Beach-Robinson, a company that had offices in the Furniture Shop. In 1909, McGlynn accepted a position working for Mathews as the chief assistant at the Furniture Shop. He held this position for a decade, installing murals, supervising craftsmen and designing for the company. In the same year, McGlynn married Gertrude Gorter and the couple moved into a home at 1919 Clement St. In 1915 the Panama-Pacific International Exposition came to San Francisco. Like many other artists, McGlynn was thrilled to have the opportunity to view and learn from original French Impressionist works of art on display at the Exposition. The impact on McGlynn resulted in a new focus in his artwork. He became less decorative and symbolic, focusing more on the effects of light. After leaving the Furniture Shop in 1918, McGlynn began teaching art and craftsmanship to a younger generation of artists and artisans. He began at the Girl’s High School with stagecraft, drawing, and the history of art. Over the next twenty-seven years, McGlynn added courses at the Hebrew Orphanage and Galileo Evening School. Despite his long hours and dedication to teaching, McGlynn and his family continued to travel on the weekends and during summers, painting landscapes up and down the coast. 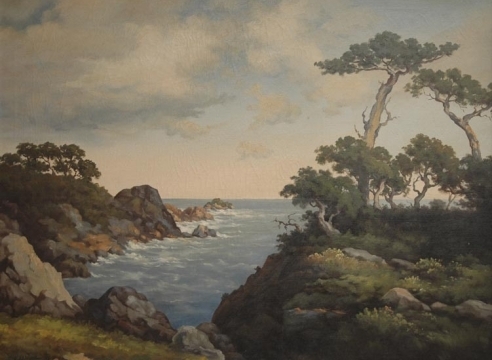 McGlynn returned regularly to the Monterey Peninsula and, in 1934, he was granted membership to the Carmel-by-the-Sea artist’s cooperative. The president of the cooperative, Armin Hansen had been in the 1906 class at California School of Design with McGlynn and invited him to join the group of plein air painters in Monterey. Despite his dedication to teaching, McGlynn and Gertrude could not resist the offer and soon bought a home in Pebble Beach. For a few years the family made the long trip on weekends and eventually they moved permanently to the spacious estate. Thomas A. McGlynn died at the age of eighty-eight in June of 1966. 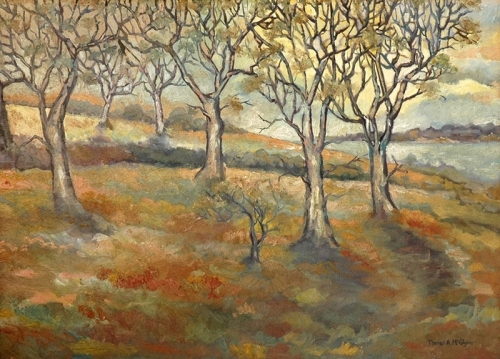 Despite the changes in the art of Northern California, McGlynn’s lyric paintings convey a romantic view of the world. They are not photographic representations of the world around us; they are poetic representations of the coastal areas McGlynn called home. The golden light that passes across his canvas’ attest to the happiness he and his family always enjoyed. 1. Westphal, Ruth. 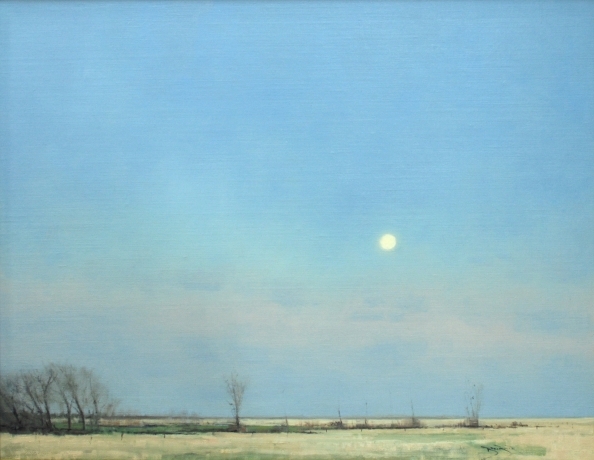 Plein Air Painters of California: The North. Westphal Publishing: California. 1986. Pg 114-119.